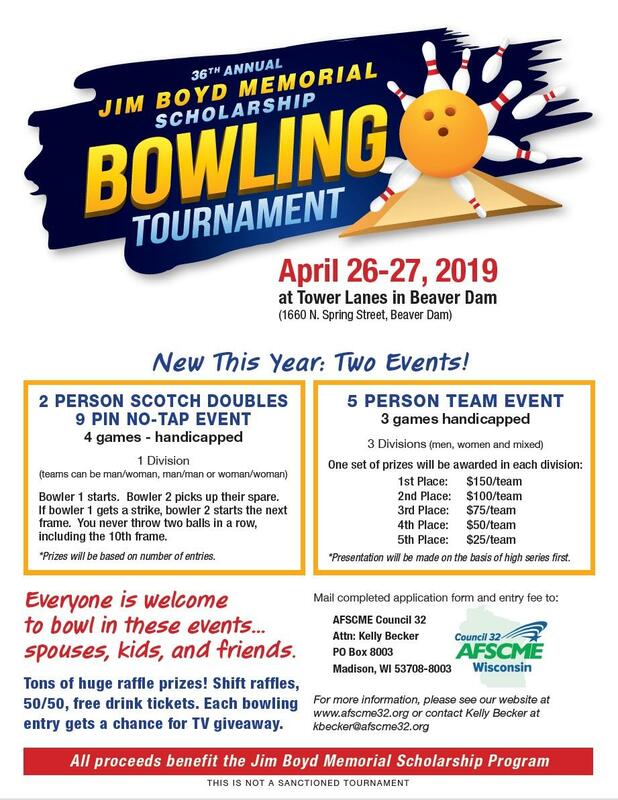 The tournament will take place Friday, April 26- Saturday, April 27, 2019 at Tower Lanes in Beaver Dam (1660 N. Spring Street, Beaver Dam, 53916). Everyone is welcome to participate! Please bring your spouces, friends, and kids. In addition to bowling fun, we'll have tons of HUGE raffle prizes, shift raffles, 50/50 tickets, and free drink tickets! Each bowling entry is automatically entered for a chance to win a TV! 2 PERSON SCOTCH DOUBLES 9 PIN NO-TAP EVENT: 4 games - handicapped 1 Division (teams can be man/woman, man/man or woman/woman) Bowler 1 starts. Bowler 2 picks up their spare. If bowler 1 gets a strike, bowler 2 starts the next frame. You never throw two balls in a row, including the 10th frame. *Prizes will be based on number of entries. 5 PERSON TEAM EVENT 3 games handicapped 3 Divisions (men, women and mixed) One set of prizes will be awarded in each division: 1st Place: $150/team 2nd Place: $100/team 3rd Place: $75/team 4th Place: $50/team 5th Place: $25/team *Presentation will be made on the basis of high series first. 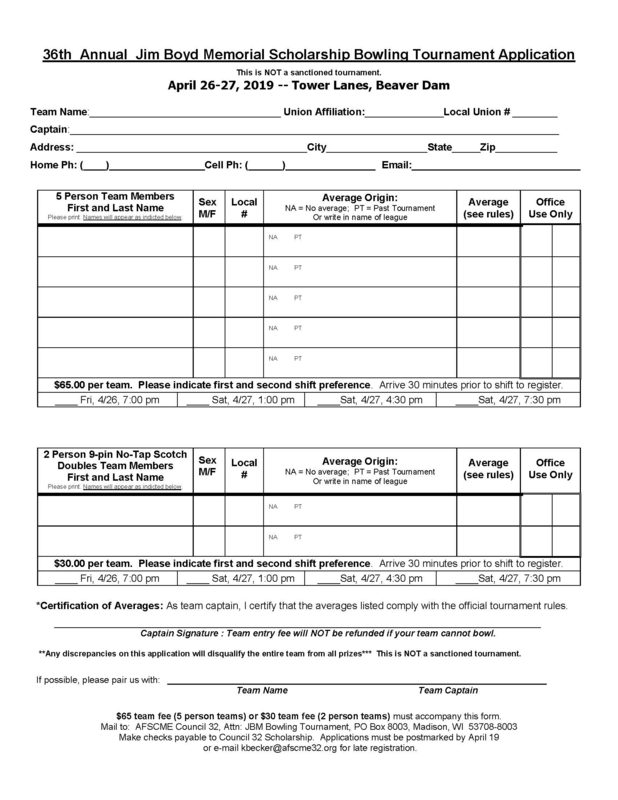 To enter, please mail the completed application form and entry fee to: AFSCME Council 32 Attn: Kelly Becker PO Box 8003 Madison, WI 53708-8003 For more information, please see contact Kelly Becker at [email protected].